Home / Social Media Marketing / IFTTT simplifying social media management services. Social media management is a hefty task, but equally important and worth bearing the pain. Social media is one thing if done can pay well adding to brand reach and credibility factor. But, with constant and huge no of posting of content required to be done regularly makes it ‘hard earner butter’. Though it is important to maintain high engagement, continuously availing content for your viewers, increase traffic, increase followers and maintain an active profile ensuring brand awareness and credibility. Thanks to IFTTT, posting content won’t be time taking any more. With great features allowing to post a content on multiple platforms at the same time, Social media management won’t be difficult anymore. 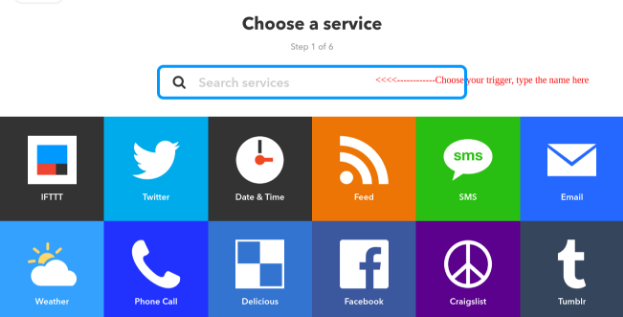 Introducing Ifttt, a new tool to streamline work of an SEO Expert. IFTTT (If this then that)is a recent development in the web industry, especially profitable for SEO experts. SEO experts do a lot to maintain their client’s trust and keep them content. So, this is one tool letting daylight in their life. 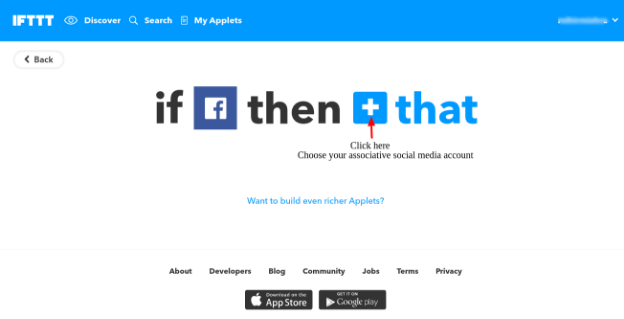 This is a brief guide to IFTTT to help you utilize it to maximum benefit. Now, you are on the welcome page which looks somehow exactly like the picture. Next process is to sign up, as you’re new, you have to sign up with IFTTT by clicking on the top-right corner of the screen. The red arrow is pointing there, please follow it. The second step is to sign up using your credentials.You will be asked for your email and a password for IFTTT login in future. Your existing email id is enough to do so. As you click on the sign-up button, you will be directed to a page which looks like this. After you click on the signup button you will be directed to this page. 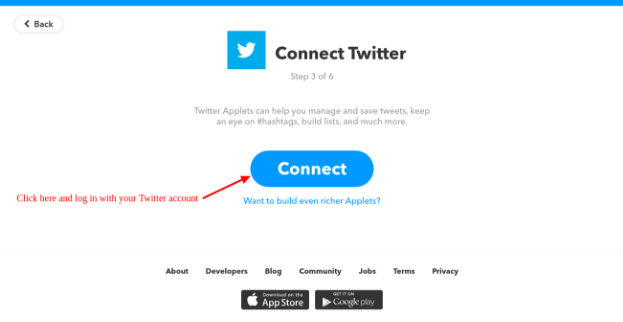 To create an applet, first, you must have knowledge of What is an applet? 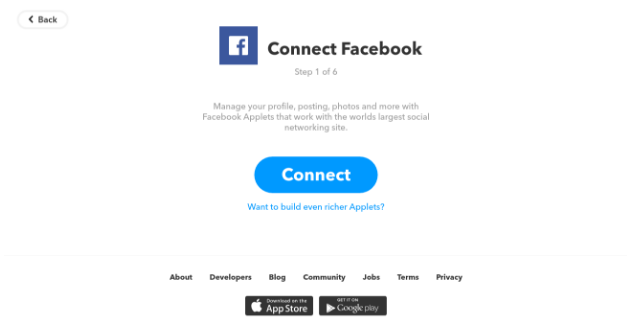 So, in simple terms, an applet is a connection of two social media platforms in which one acts as a trigger and the other acts as an associate. When you post something on the platform set as the trigger, the post directly gets posted on the associate social media platform. So, you are posting on two platforms using one. Make sure your applet is switched on. 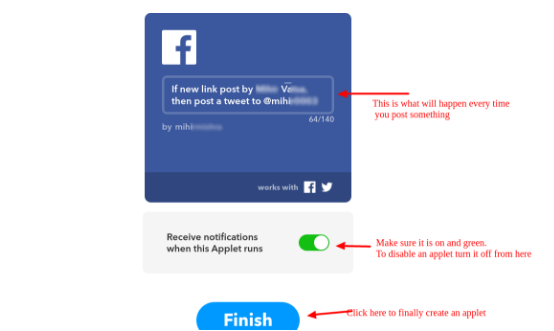 Now, you have to create an applet according to your content that you are posting. Be wise when you do that, create multiple applets if you want. 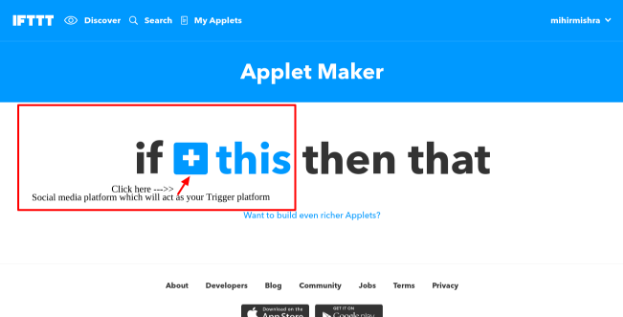 You have to provide login credentials to IFTTT while creating an applet. You will be directed to a new page like this. Now your job is to choose your trigger (Trigger will be the platform from where you will post the content). 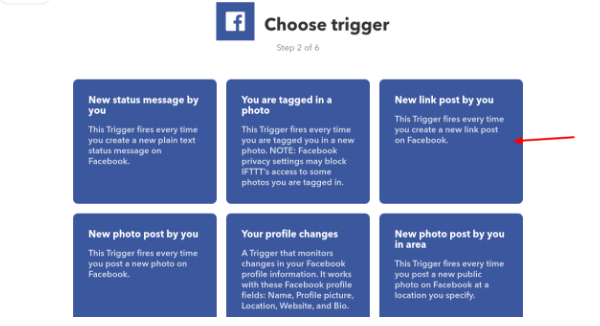 I will be choosing Facebook as the trigger, but you can choose any other trigger depending on the type of content you will post. There is a red arrow pointing to a big addition sign, you have to click there. A list like this will appear. Now you have to choose your social media platform which will act as your trigger, just click on the platform option image. 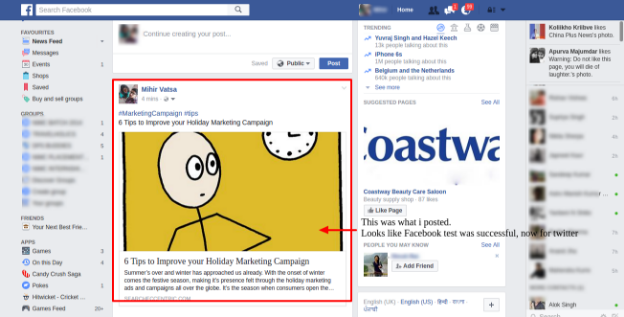 If you have opted Facebook as your trigger, you will get 100% same page or else the things can be a bit different. Like the connect facebook option will turn to your opted platform. Let’s say for an example you choose your trigger as Twitter, then your page will say connect twitter. From here the six step starts to create an effective applet. In the 2nd Step, you will be directed to a page which will ask for your desired action which will be taken as a trigger. So, everytime I post some link on my facebook account, the content will be directly posted as it is on the associated social media platform. There are 10 options in total, you can choose whichever you want depending on your social media activity. Step 3 will direct you to a page that will ask you to choose your second social media platform (Associated platform), the second platform where your content will be shared. I am choosing Twitter to be my second platform. So, in the second part of 3rd step a page like this will appear asking you to log in with your twitter account. 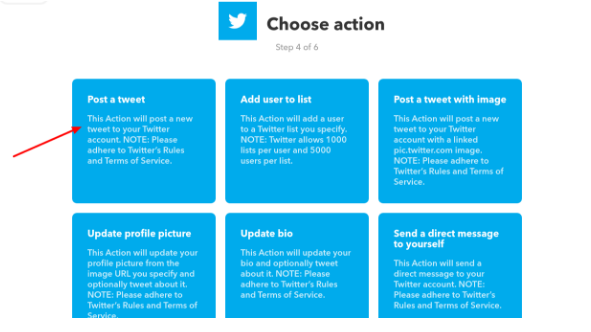 In step 4 you will be asked to choose the desired action for your associated account (Second platform). For an example, I’m going with the first action which will post a tweet from my side using the facebook post that I will do on my facebook account. The words and link all will be same, and no one will know I didn’t do it if I use it properly. 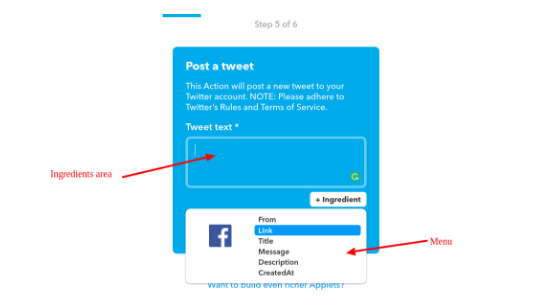 Step 5 will be something like this, asking you the ingredients of your second account post. 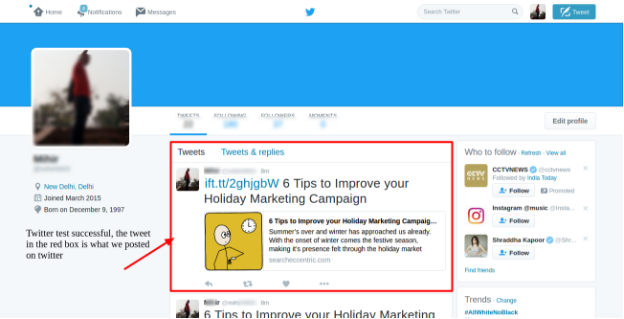 Now, as you can see below tweet text there is a box in which are two boxes saying, Message, link. Below the box, there is a white box which says ‘Ingredients’, click there and choose two ingredients or content of your post. Make sure you clear the two default white box appearing in the ingredient area (Black arrow is pointing at the same). 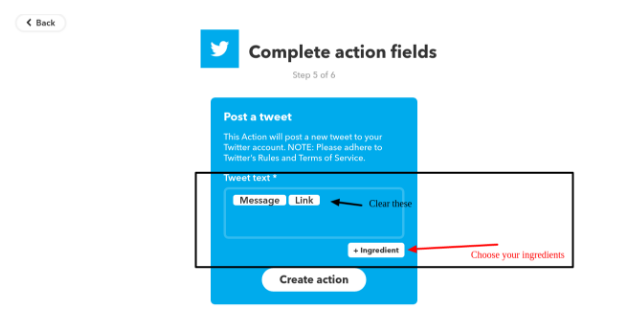 After choosing your ingredients, click on create action. And you will move to the step 6, where you have to just click on finish and you will create your first applet. Now just log out from IFTTT, and open your twitter and facebook account on different tabs. 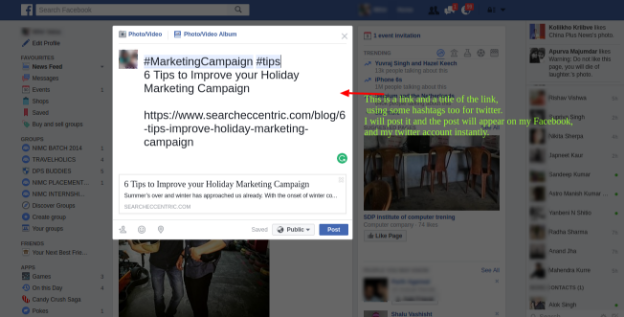 Log in your Facebook and twitter account, and post a link with a title on your facebook account. This is a link and a title of the link using some hashtags too for twitter. I will post it and the post will appear on my Facebook, and my twitter account instantly. This was what I posted. Looks like the Facebook test was successful, now for twitter. Looks like twitter was also a success. This is all for now. “A wise man said, you never learn unless you try” so, try the guide and test how much you were able to grasp. 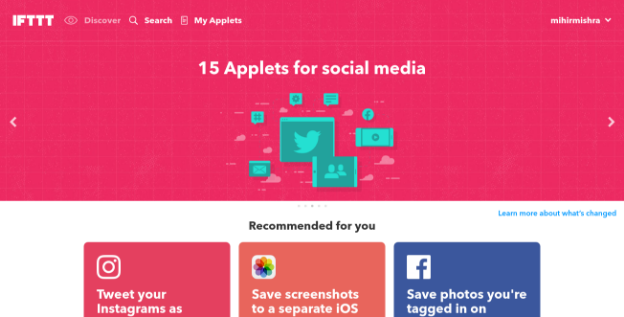 Create your applets and do some fun.